Over the years experienced seafarers work out their own voyage packing list. But what about novices to the maritime industry for whom job at sea is a new experience so they do not yet know what they might require onboard. 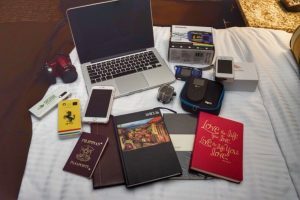 In this article we have prepared a number of tips that will help the newcomer get ready for the trip. Check with your crewing company the navigational area of your future vessel so as to pack your clothes based on the climatic zone in which you will be working. In case you will stay in a hot climate all the time take more T-shirts, underwaists and shorts. Moreover, don’t forget to divide your clothes to the ’smart’ category in which you will be going out and the ‘working’ which can easily be left on board at the end of the contract. The opportunity to swim is an additional bonus to the voyage in hot countries, so do not forget to pack your swimming trunks. If you have several months of winter in store for you, do not be stingy with buying thermal clothes. It occupies minimum space in your suitcase, but keeps warm perfectly. Also, you will inevitably need boots, cap and scarf, gloves, some warm jacket; and if you work on a deck, you’d better pack a wind-resistant balaclava to wear under your helmet so as to protect yourself against bitter cold winter sea winds. Wherever you go bring at least 5 – 7 pairs of socks and underwear. There is no problem with washing on modern vessels, but there is a considerable issue with purchase of new items. Experience has shown that container ship crews are especially prone to face such problems as they have most busy port schedules. In addition, harsh safety shoes wear socks alarmingly quickly, so pack only high quality items with you. Think through what kind of clothes you will wear in your free time. 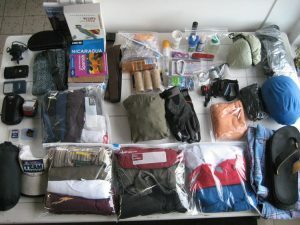 Most maritime professionals pack a tracksuit and 2 or 3 T-shirts with it, increasing an amount of clothing slightly depending on the length of the voyage. In addition, it is necessary to provide 1 – 2 outfits for going out. The useful tip how to travel light is to fly to your vessel in one of such sets of clothes and shoes while having the second packed in your suitcase. Regardless of the voyage region and season, experienced seafarers always recommend having a warm sweater with you. It can be useful both on board and in case you get caught by a cold snap in the middle of a summer. Remember that step-in shoes are prohibited onboard, so prepare comfortable closed footwear even for your free time wonderings around the vessel. Another useful tip! Panama or a rag back proves to be a very useful garment for seafarers working on a deck. Experienced Able Seafarers strongly advice working in this headwear during summer season instead of baseball cap explaining that they are far less often blown away by wind. Do not forget your rubber slippers for shower room. Sea voyage is challenging enough without a foot fungus treatment. Working clothes is worth a separate paragraph. Most companies provide overalls and safety shoes onboard, but it might be a good idea to ask your colleagues already working for this shipowner about the quality of these overalls. They might be rather uncomfortable to wear; while warm jackets usually are the last items that are updated or washed. As a result, many seafarers prefer bringing their own overalls, safety shoes and jacket to ensure that they will fit perfectly and be comfortable to spend the entire voyage in. Pack at least 2 toothbrushes with you. Seafarers with a considerable sea experience agree with dentists about changing your toothbrush every 3 months. When it goes to toothpaste, the more you take the better. It seems that this product can be purchased anywhere in the world; but at times vessel berths for very short time, so it becomes a real issue to buy something. The same applies to shampoo, deodorant, cotton buds, razor blades, shaving foam and lotion. Pack large bottles and maximum size packages to avoid wasting much-needed time in city searching for hygiene products. It is always better to save it for more pleasurable activities. Another good idea is be to bring a foot cream. New safety shoes can deliver a lot of inconvenience to your legs, so a small tube of special cream will be a remedy at the beginning of the voyage. Many seafarers also carry a hair trimmer – a simple and convenient way to maintain a well-groomed appearance during long voyages. Mobile phone and external battery for recharging your gadgets during the flights should go to the hand luggage. Do not forget your laptop or tablet with uploaded movies, TV series, music, books, games, etc. to ensure an interesting and productive leisure time; chargers to all your gadgets and phone are very important as well. In addition to chargers, you will also need adapters and USB connectors of all kinds. A wide variety of network adapters can be found at airports. Buy several types for different countries as they will definitely come in handy at some point of your travelling. It is also advised to take extra flash drives and external hard drives. Bring more some material for self-development onboard. All seafarers acknowledge that time of the voyage is a great opportunity to pull your professional knowledge up, learn a language or develop some useful skill. Pack the necessary small items like: headphones, watches (better inexpensive and waterproof), sunglasses and tea (there have been many questionnaires about items most often brought onboard and “big pack of tea” was featured in almost all of them; a good cup of tea is a rare thing on a vessel). Flashlight. Experts advise to have a small flashlight with you in the cabin to use in the case of a blackout. Antipyrexials such as Ibuprofen, Paracetamol or other drugs that will keep a fever down. Painkillers and headache medicines. Select them according to your individual needs, but remember that some drugs may require a medication form in foreign countries. Food poisoning medicines and drugs promoting digestion; plus it is always good idea to take Imodium in your hand luggage. Plaster, some antiseptic drug, ointment for bruises and sprains, healing balm. Individual prescription meds if you are taking any. As in paragraph 24, be sure to have a medical form with you to present to the inspector in case of an onboard Drug & Alcohol test. Vitamin complexes with calcium. Many seafarers bring Ca solutions to voyages since a monotonous diet and massive sweat loss in hot climates affect quality of teeth and bones adversely. Take documents, certificates, money, gadgets and all valuable things with you in your hand luggage to ensure flight to your vessel passes without unpleasant incidents with theft or broken cameras. Psychological comfort is of a paramount importance during a long voyage. So make sure you have an opportunity to do your favorite thing. Many seafarers take sport gloves and sneakers to exercise in their free time. Some carry fishing gear others prefer Go Pro cameras for impressive time lapses of big storms. There are even maritime professional who come with embroidery kits and tools for carving. If you have a hobby, do your best to bring it onboard. In this list of tips we have collected only the necessary minimum. Add those things that can make your life and work far from home and in closed space nevertheless comfortable and pleasing.